Love for the Arabic language is nothing new for the people around the world and there are different ways of showing it. Some do it by learning the language itself or some are just fascinated with the beautiful calligraphy and want to give it a shape. The latter group does so with the Arabic tattoos. 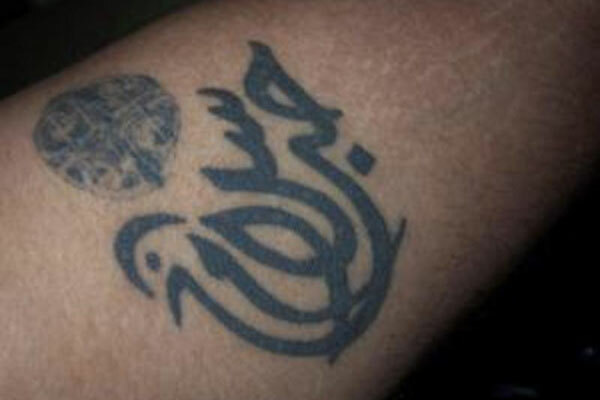 Though some believers of Islam are of the view that tattooing is against the ethos of their religion, even Arabs can be seen wearing the Arabic tattoos. These tattoos mostly consist of the name of the person or their dear one like son, daughter, wife, husband or partner. Apart from this, spiritual or serene words or a line are also popular as tattoo designs. As said above some are just fascinated with the look of the script. Therefore, for them words or meanings do not matter. 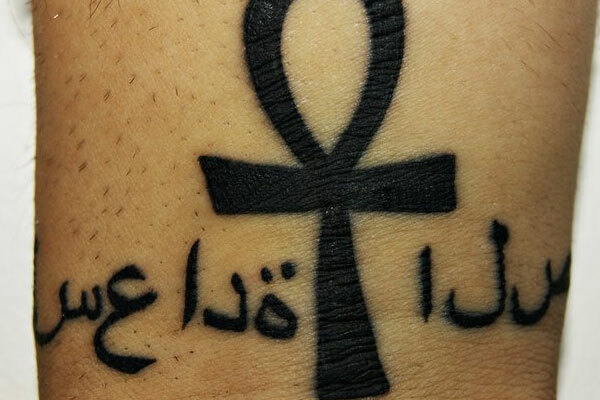 They just get the Arabic alphabets carved on their body parts. The Arabic script is really elegant and artistic. The cursive letters are full of beautiful twists and turns, thereby, creating a mesmerizing display. If you are also an Arabic enthusiast and looking forward to a tattoo design, do check out this post. 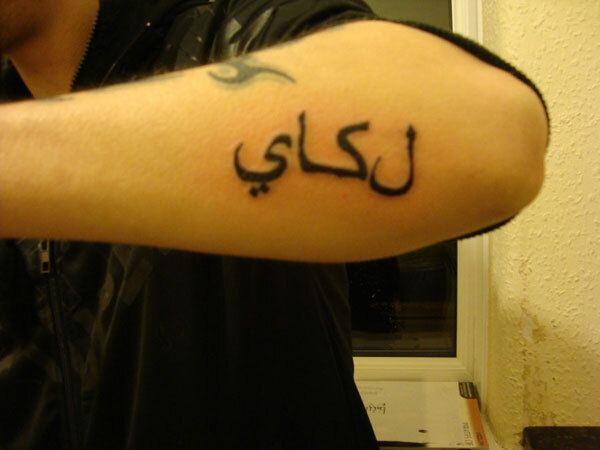 It will give you a very good insight into the world of Arabic tattoos. If you like this article, you might be interested in some of our other articles on Chinese Writing Tattoos, Indian Tattoos, Chinese Tattoos and Hispanic Tattoos. 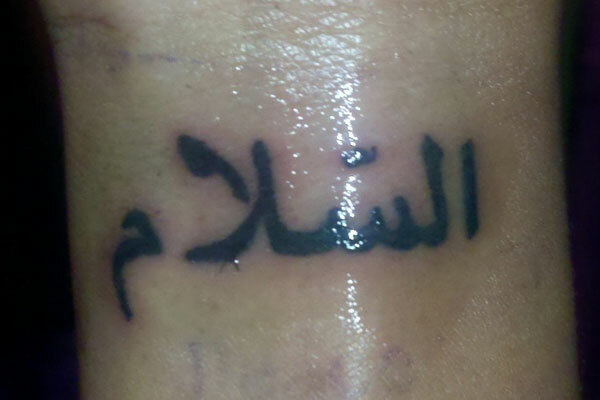 Getting one’s own name carved in Arabic is quite common and this girl did the same on her forearm. The Arabic liner means faith, hope and love carved along with a dove symbol that looks soothing and serene. 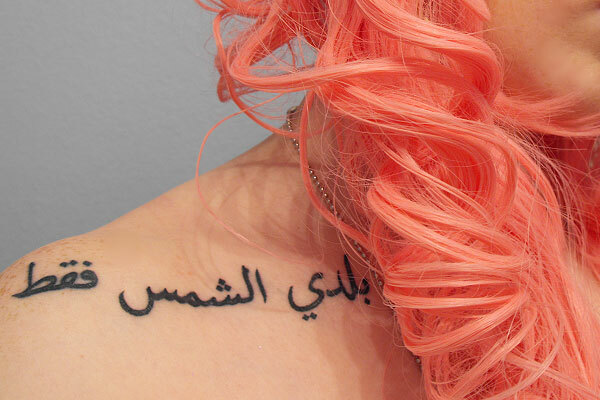 The Arabic tattoo means “My Only Sunshine” and looks more flattering with the rolled orange hair. 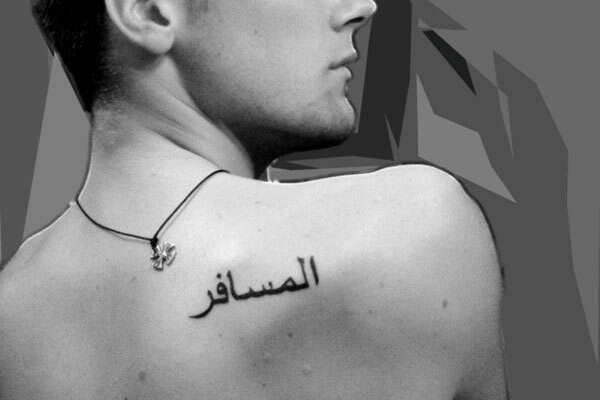 This Arabic tattoo bears the first name of the wearer and has a pleasing look. This beautiful line in Arabic means “my soul” and is used by the Arabs as an endearing term. The loving father shows love for his daughter through this tattoo that bears her name. 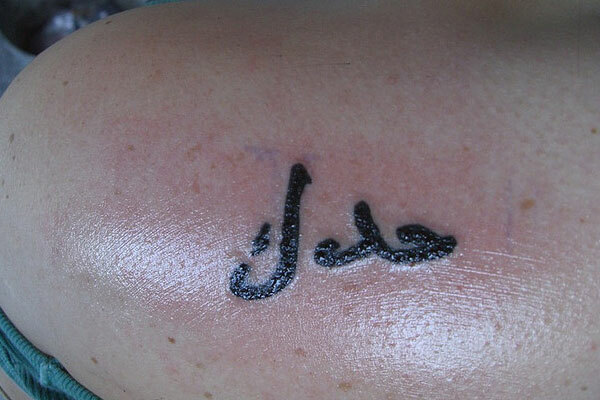 This lover has sgot her beloved’s name carved in Arabic as well as English on his back. The first three words mean endless love and the last word is for Jesus. 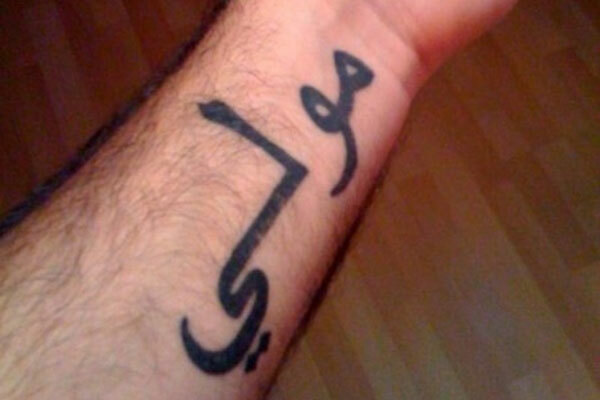 This tattoo has two Turkish words, created with Arabic alphabets. 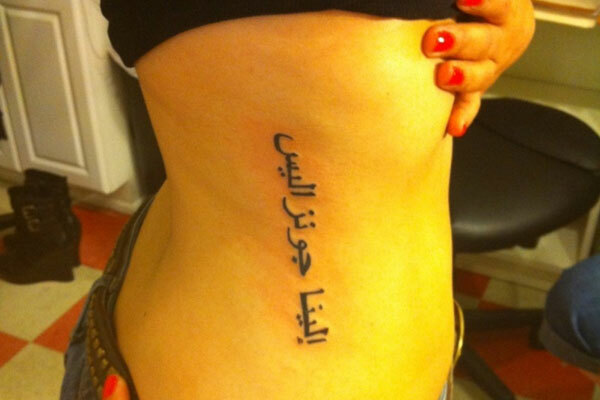 The Arabic loving girl got her name Elena Gonzalez carved in the same language on her ribs. This cross is a sacred Egyptian symbol which has been carved along with the words happiness, life and health. The Arabic line saying “for our god is a consuming fire” carved with a flame motif presents a spiritual design. The famous poet Rumi’s lines carved on chest along with two colorful birds on sides look charming. The meaning of this Arabic liner created in bold fonts is “waves crashing”. 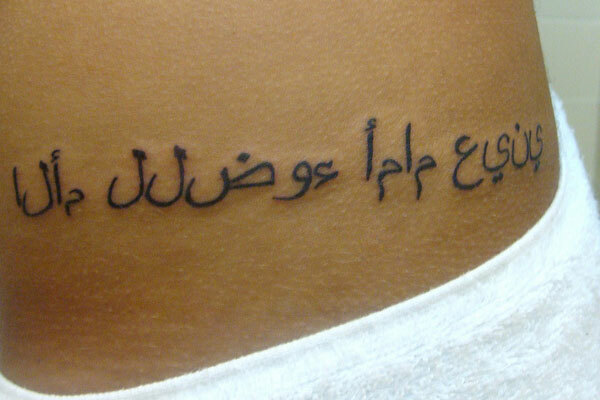 This is an Arabic tattoo that has been engraved on the rib just for the sheer love of the language. The woman got her son’s and partner’s name engraved in Arabic on the edge of her palm. Located under the collar bones and created in scarlet red ink, the tattoo reads “stay strong and just breathe”. The two symbols are salaam and houb which stand for peace and love. 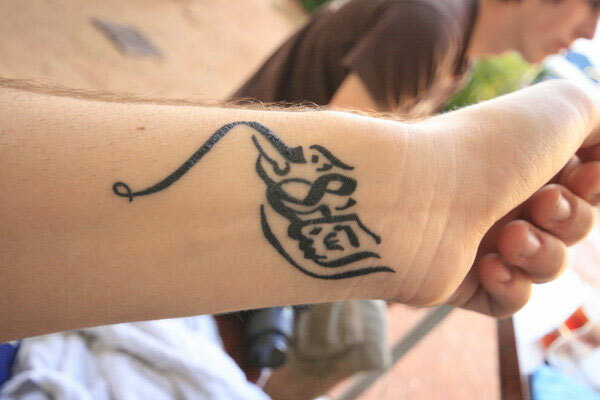 Arabic tattoo on wrist that says “Al Salam”, meaning peace. 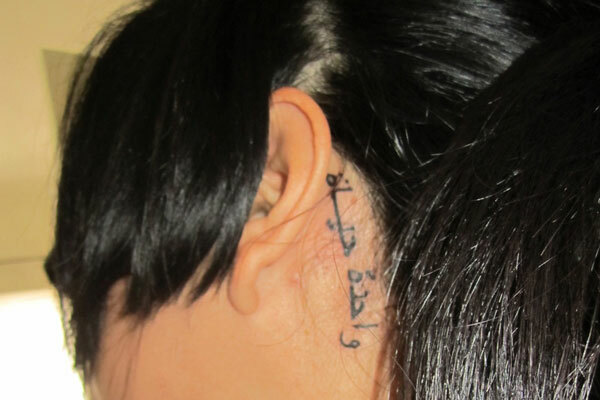 This woman got the words “One Life” inked behind her ears, in Arabic, after she was kidnapped two times. 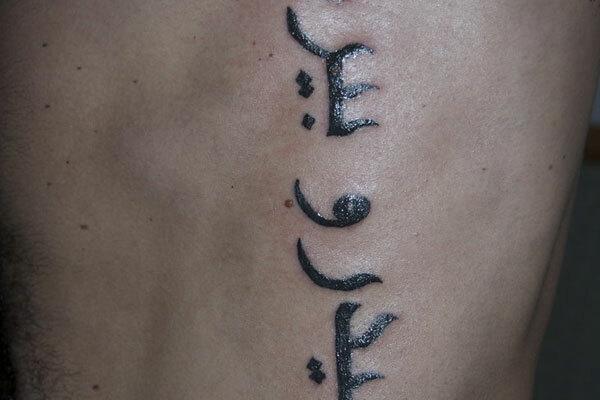 The Arabic script has an exquisite script and the tattoo design carved in it looks unique. This elegant word in Arabic has been carved on the leg, just above the ankle. The Arabic word inside the colorful rectangular block with beautiful embroidery means soul. 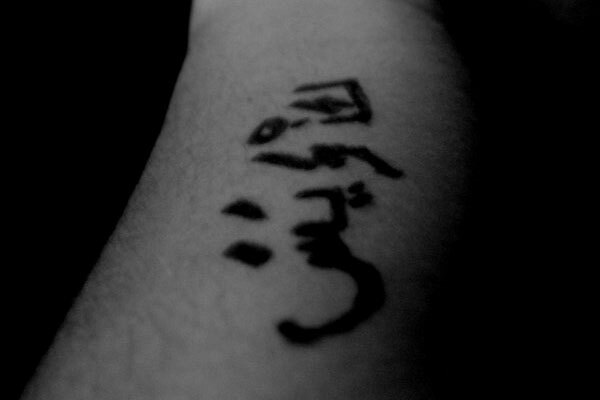 A person’s name inked in Arabic around his wrist, acting as an inspirattion for others. Arabic alpahbets carved on the wrist which, most probably, together say “Dominique”. 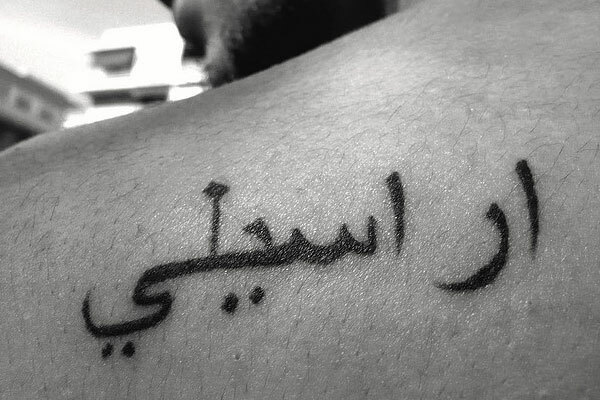 This word stands for courage, in Arabic, the most needed trait to succeed in life. 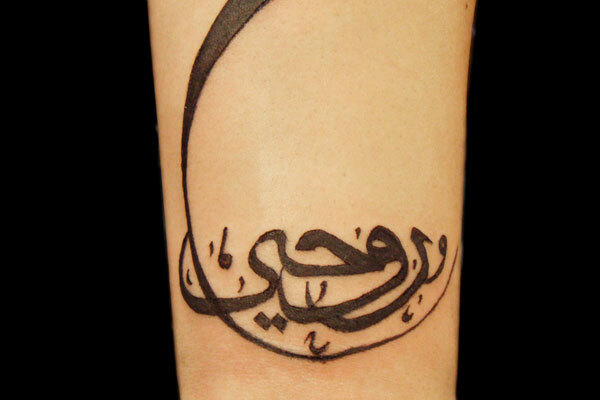 The shoulder tattoo represents the name of the wearer’s son, inked in Arabic. This Arabic word stands for jealousy, which is the most negative feeling. The Arabic letters lying in a vertical fashion over the ribs look intriguing. Arabic words, in bold font, look even more enticing with their curves and spots. This is actually a Tibetan prayer flag. The lettering inside the embroidered mirror has an artistic display. The woman has got the guardian angel lettering inked on his arm, in Arabic. The tattoo stands for Karl, the name of the wearer, who got it carved on his forearm. Traveller, inked in Arabic, on the upper back of this man has healed completely. 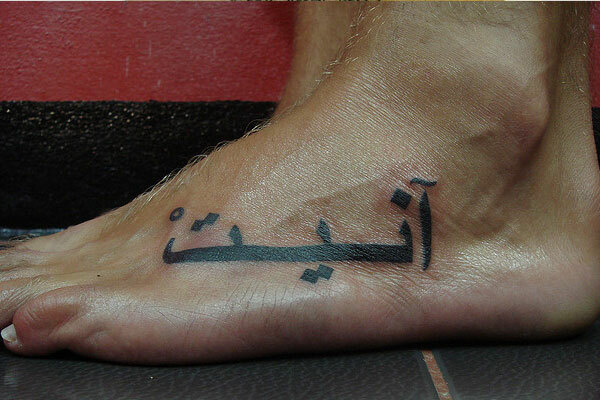 This Arabic tattoo, sitting on th edge of the foot, looks cool and attractive. 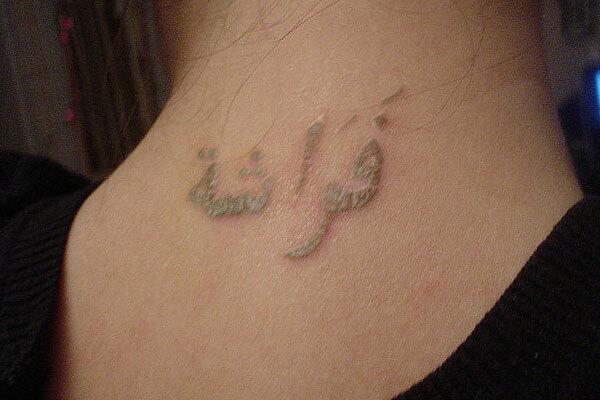 A small Arabic tattoo, placed on the shoulder blade, has a cute look. This Arabic tattoo standing for butterfly has faded out but still looks nice. Wrist tattoo, standing for peace, carved in Arabic. The twin Arabic words, resting on inside of the forearm, are for Isabella and Sofia. 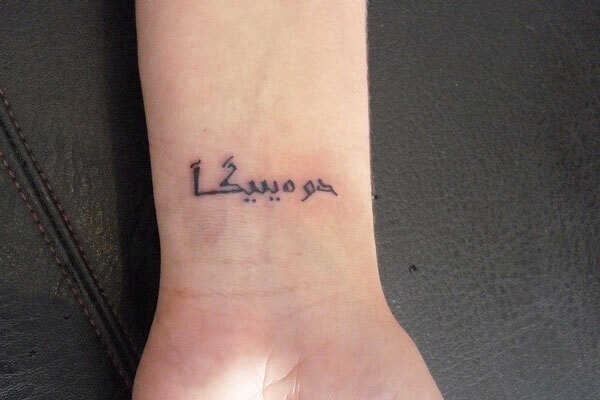 The girl has got an Arabic tattoo on her forearm for the sake of her love for the script. and some of them weren’t even real words !! make sure it’s in that order from right to left, I put a large space between the two words so you can distinguish the words apart. How do you spell katarzyna in Arabic? Hello how do you spell marco Moses I’m half arab but my parents never able to teach me arab but iknow only my family history can you help me out. Can you please translate “count your blessings” into Arabic? Can u translate ERISHA and life??? Also, don’t use standard text – it looks makes it look like a typewriter accident. 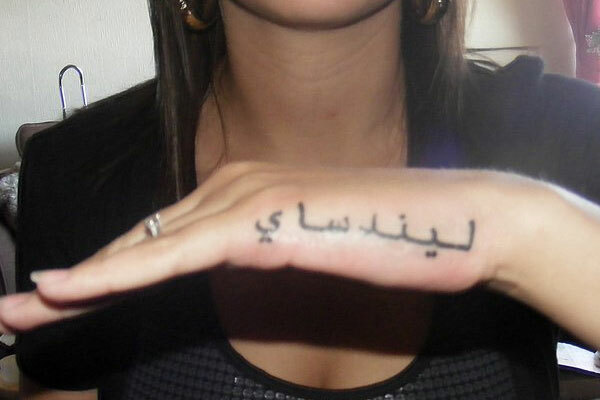 Please translate “eternal love ” in Arabic for me . Could you translate ‘ Guardian Angel ‘ please? Can you translate “fearless” please? However, if the “Karl” tattoo wishes to say K A R L i.e. transliterated, then unfortunately for him, it does not. Also, the L is not correctly attached to the rest of the word. 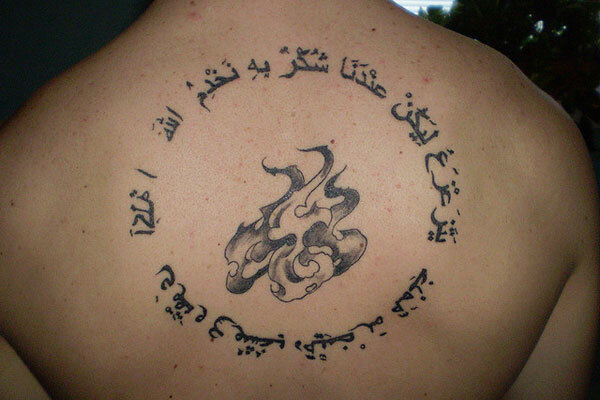 Hey can you please translate, “my soul holds loyalty” ? that is wrong it is not QUL and does not mean SAY, that is a different word. it’s A repetition of one arabic word ( Iqra ). i would like to know the word “fly” or “i fly” in arabic please if somebody can help thank you!! this translation is not exact because the meaning of the word my change depend on the sentence used with it. however the meaning in arabic sound a little bit lame. 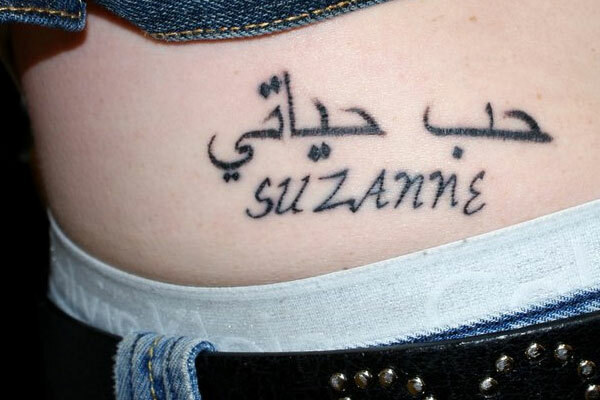 SIr can you translate the name Susana in arabic? 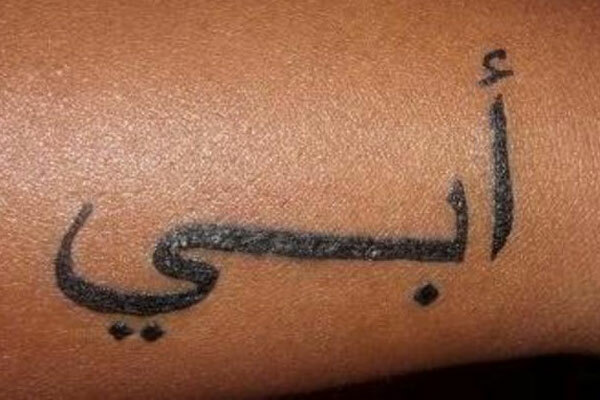 I’m arabic and i have to say most of these tattoos are missed up , either the meaning is wrong , wrong spelling , words written backwards or the font is super ugly. Hey ALyacoub, could you please translate ” Live today forget about tomorrow ” and also could you give me some advice of which font should i use. It will be tattooed on my hip left hand side from below of my armpit downwards. I will be grateful if you could help me. My advice is not to tattoo yourself with these lame sentences, if you really love these words apply them in your life practically. hey ya, if i were to write something in arabic vertically, (i know it cant be written vertically.) but it would be possible to write it so that if it were to be read you would turn your head to the side etc. so would it be appropriate to write it so that the first word is at the top or at the bottom?? Can you please translate the names ”Abigail” & ”Taha” for me? Is the translation here above ”enternal love” correct? Could you translate “Yusef” and “werewolf” in arabic for me please. Very much appreciated. i agree with alyaqob. its so sad these people have tattooed weird things on their skins that are not close to the meaning they serious should have done more research. Every self (also means soul) tastes (not sure, the word spelling you wrote is weird) death. Would someone please convert freedom for me in Arabic? And explain when you’re semantic to put the ‘Alif’ infront of words? The “Alif” in the begining of a word is just like adding “The” it gives it a powerful sound and meaning. do you call her kalila or khalila? don’t forget that arabic starts from right to left! These tattoos are all stunningly beautiful. 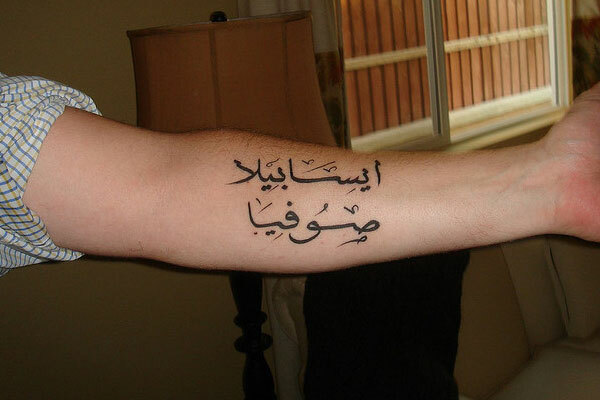 Arabic wording is not something I had thought of before for a tattoo, but now I really have to get one. My son’s name is Riley, and I have always wanted the words THE LIFE OF RILEY tattooed on myself somewhere. Would you be able to translate that into Arabic for me, please? Ø­ÙŠØ§Ø© Ø±Ø§ÙŠÙ„ÙŠ. Remember it has to be from right to left. 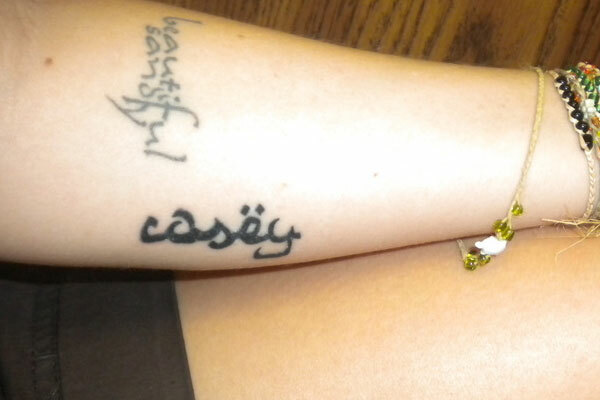 I would love to have the word daughter translated and made into a tatoo in honor of my father. Ø§Ù„Ø®ÙˆÙ Ù„ÙŠØ³ Ø­Ù‚ÙŠÙ‚ÙŠØŒ Ø¥Ù†Ù‡ Ø¥Ù†ØªØ§Ø¬ Ù„Ù…Ø§ Ù†Ø®Ù„Ù‚. Ø§Ù„Ø®ÙˆÙ Ø¥Ø®ØªÙŠØ§Ø± Ù„ÙƒÙ† Ø§Ù„Ø§Ø¬Ø±Ø§Ø¡Øª Ùˆ Ø§Ù„Ø§Ø®ØªÙŠØ§Ø±Ø§Øª Ø§Ù„ØªÙŠ Ù†Ø£Ø®Ø°Ù‡Ø§ Ø­Ù‚ÙŠÙ‚ÙŠØ© Ø¬Ø¯Ø§Ù‹. Ù„Ù‡Ø°Ø§ Ø³ÙˆÙ Ø£Ø®Ø° Ø§Ø¬Ø±Ø§Ø¡Øª Ùˆ Ø³ÙˆÙ Ø£Ù‚Ù‡Ø± Ø£ÙŠ Ø´ÙŠØ¡ Ø£Ù‚Ø§Ø¨Ù„Ù‡ Ù„Ø£Ù† Ù„Ø§ Ø´ÙŠØ¡ Ø­Ù‚ÙŠÙ‚ÙŠ Ø£Ùˆ ØºÙŠØ± Ø­Ù‚ÙŠÙ‚ÙŠ Ø³ÙŠÙˆÙ‚ÙÙ†ÙŠ. Hey! Can somebody help me? I need “Deyanira” in arabic, “Love” , and the word “Family” also. Thank you!! The words should have been switched. I’m beautiful in my way Cause God makes no mistakes I’m on the right track, baby I was born this way. please do it guyz plssssssssss. Hey guys, can anyone could please translate “ Live today forget about tomorrow “ and also could give me some advice of which font should i use. It will be tattooed on my hip left hand side from below of my armpit downwards. please translate Chloe Alessandra in Arabic? I would really appreciate it! Hello, can anyone please translate this for me : «How many chances do we get »? I’m told ÙƒÙ… ÙØ±ØµØ© Ù„Ø¯ÙŠÙ†Ø§ is that accurate? It should be reversed like that too. It was great viewing these designs, thanks for the share. most of them are misspelled or wrong! I like the Collar Bone Tattoo but I won’t put it on the shoulder maybe some other places like the side perhaps. It would look great! is better translation because in Arabic language beside letter we have these small punctuation marks that may change the word meaning. Can I please have this translated into Arabic in the 3 lines please, I just want to compare my results! Is it for male or female? 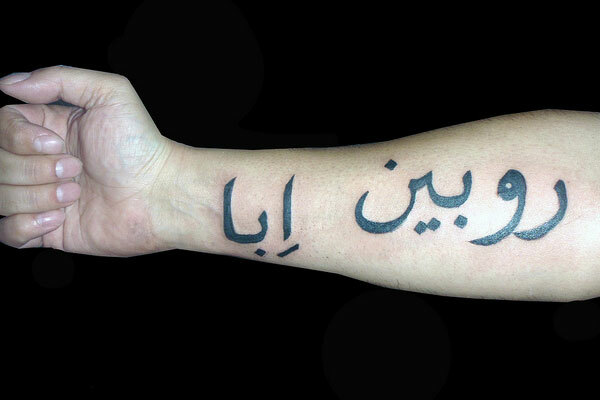 I am going in 2 weeks to get “Khalasna” (english meaning enough) tattood and the spelling I have found is “Ø®Ù„ØµÙ†Ø§” can you confirm that is right? these are correct, but it is not a good idea to get them as a tattoo. 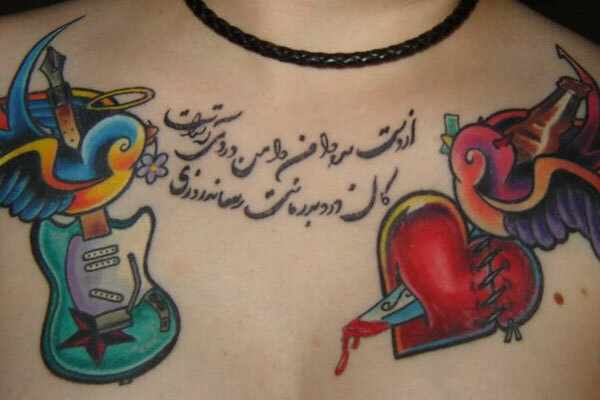 I want to know how to write “what doesn‘t kill us, make us stronger“ and “miss you” in Arabic, to make a tattoo. Also, is there a sign for “Fraternal Twins” ? Can you please show me how to write “family forever” in arabic, in the best format you can think of. My son is getting his first tattoo and he would like to put this phrase on a sword on his left forearm. The sword will be of Arabic descent. Any ideas, I would very much appreciate it. His Birthday is July 9th, and I’m going nuts trying to find something unique. Thank you in advance. Heya, can you please translate “It’s up to you what your world looks like” ?? can you please write ”stay strong” in Arabic? You can copy-paste this to google translate to double check. trust me, that’s my brother’s name! Can someone please translate “family” in Arabic please. I plan to tattoo it to my bicep and do not have a clue on how the word should look. Thank you! 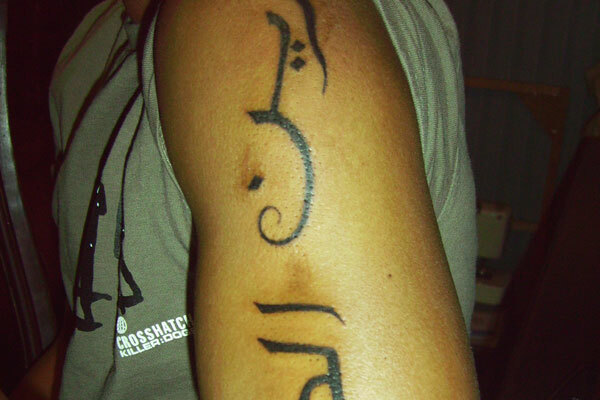 i wanna tattoo Ayman (right handed, blessed, lucky) on my shoulder. is the meaning ayman for males only? could someone pls translate in arabic ? plss :) diferent variations. can you translaste: Jamieson, also: One God in arabic? Hi, would somebody translate this word “ulacoraifal” in arab? Can you please translate the word “art” in arabic? thank u! You would need to make it definate in Arabic, so Al-fan would be correct. You are trying to aplly English grammar to Arabic which is a mistake. If we just mention somethig – ART – we need to say THE ART in Arabic – ART on its own would not be used. The Sun translates to Ø§Ù„Ø´Ù…Ø³ (al-shems). 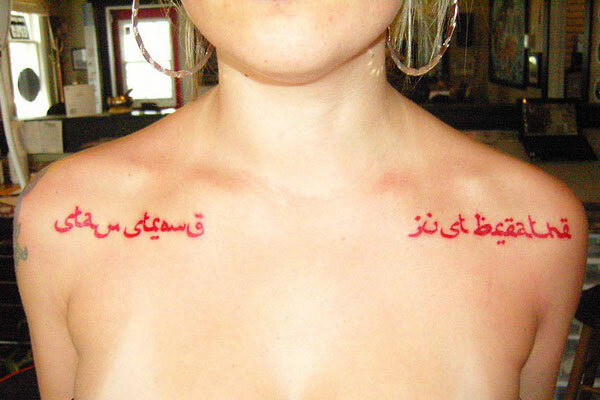 I’m looking to get an arabic tattoo sometime this week, and am worried translators are not going to be 100 % correct. Can someone translate “I suffered I learned I changed” please? Thank you! Could someone please translate this for me “turn your wounds into wisdom”? Please and thank you. Beautiful quote by the way! I am hoping to get the name Salim tattooed. I know it means peace, however there seem to be a few versions of peace in arabic, especially depending on how the name is pronounced- which one correctly reads ¨Salim ¨, pronounced Sa-leem? hi, can someone provide me with an arabic translation for Trina please. Which ist Better in arabic? Actually, the name Sophia exists in Arabic. We have our own name for it. So it’s correctly spelled ØµÙÙŠØ©. Not ØµÙˆÙÙŠØ§. That’s pronounced ‘Safiya’, though, which is different from ‘Sophia’. It depends whether she wants the Arabic version of the name, or her name spelled phonetically in Arabic. Could someone translate: peace, determination, courage. And tell me how you pronounce them? Is there a translation for the name ‘Claire’ and ‘love within’ please? Can somebody please translate: Josje Meijer, it’s my first and last name…thanks! 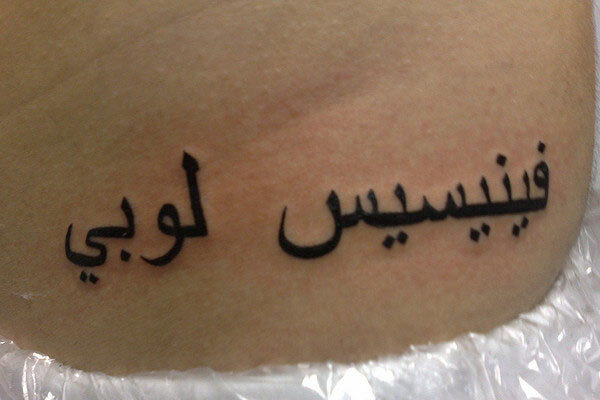 I want to have a tattoo on my back… Can anyone translate the word “NAVIGATOR” in arabic. thanks! “life must go on!” in arabic? She flies with her own wings /idont know what you mean with this is it hide any meaning! best translation you can get. What is the written arabic for ‘maktub’ meaning ‘it is written’? Ù…ÙƒØªÙˆØ¨ (maktub) means “written,” the adjective alone. How do you write ‘peace, love and happiness’ & ‘tanveer raza’ in arabic? Can you translate “One Love” in arabic? and also translate “Trust no one” in arabic too?? Can you translate “keep moving forward” please? Could anybody tell me the best way to write “Mama tried” in Arabic. As in, “My mother did her best”? Hi , I love this website ! Can you please tell me how to write -To live Is To love – in arabic . it is important to know that arabic is written from right to left . Can someone please tell me what, “Rest in peace, father” is translated ?? How do you translate: “Determination” in Arabic and also “She flies with her own wings.” ? I really want to get determination on my right ankle and want to make sure I don’t tattoo something like ‘cheese’ on it. Your help will be amazingly appreciated! Please translate ” The three of us against the world” in arabic for me. Rabia how do you write in arabic? 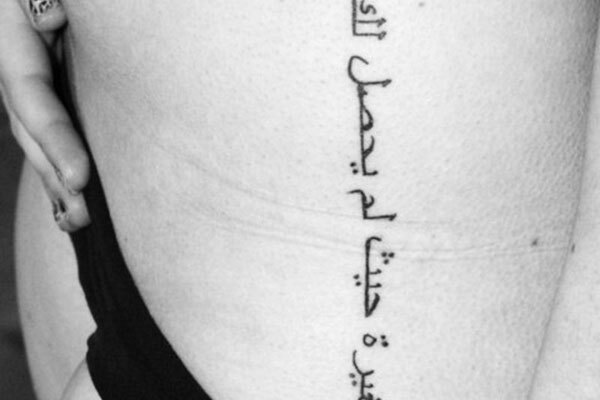 Hi, I want a tattoo in arabic soon but I need someone to translate the phrases for me. The phrases are “Whom God Hath Promised” and “Walk By Faith Not By Sight”. I would really appreciate it if you could translate them. could you translate my name beacuse i’m thinking about tattooing it. y want to make a tatoo whit my daughter. pls anyone cant translate name RAISA? How would you write al salam which means peace or long love palestine? Can someone please translate the names ” Abigail ” & ” Taha ” in arabic? hey how would you say “as beautiful as the sky”? remember to start from right to left! Can anyone please translate, “don’t worry, be happy” into Arabic please? Can anyone translate “never give up” in Arabic. can anyone please translate, “PRATEEK” into arabic ?? could someone please tranlate “time to live. time to love” in arabic please. 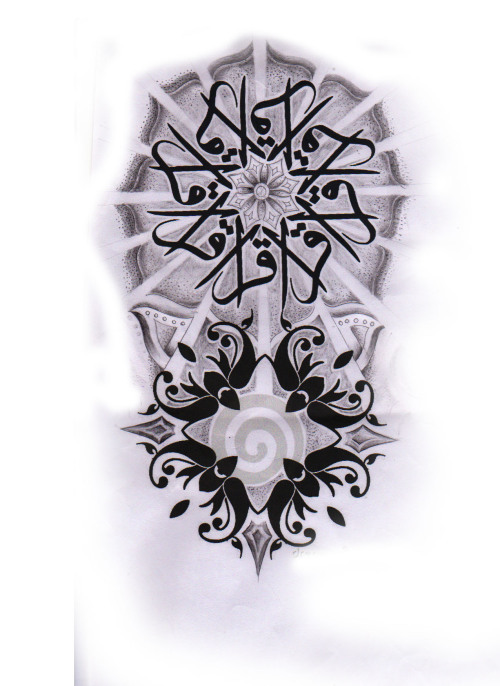 Very Nice Arabic Tattoo Design. 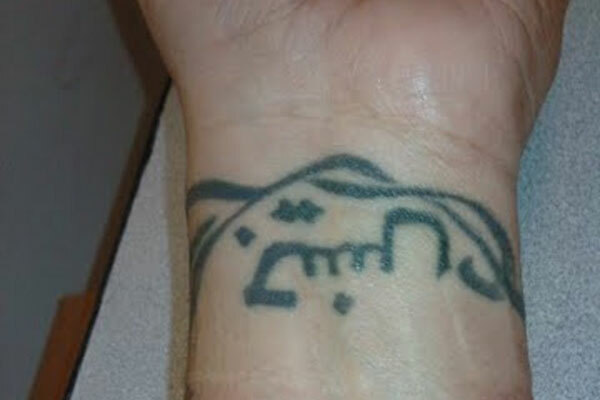 i would like to get a tattoo of my name in Arabic, can anyone help me out? make sure that you remember that arabic starts from right to left! 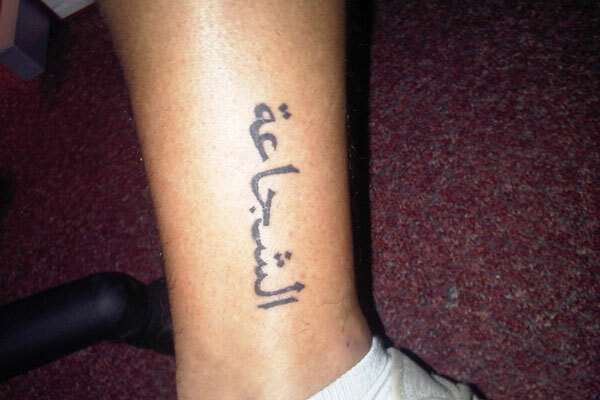 can anybody translate “Be at the feet of your mother and it’s paradise there…” in Arabic and also its pronunciation. I cant believe how many of these are REALLY messed up. I am not even a native Arabic speaker, I just took a couple of years in school and am married to an Arab. Wow, just wow. 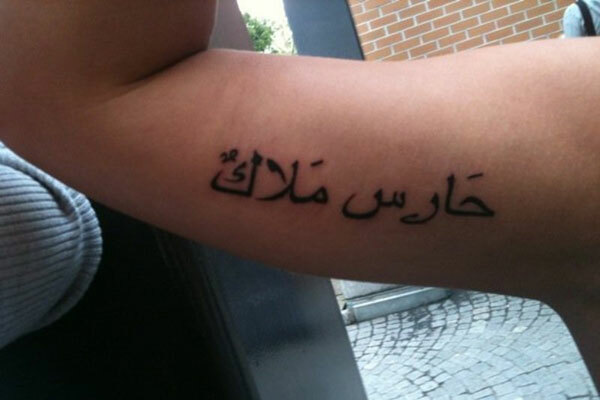 I suggest people talk to a native Arabic speaker before they put something on themselves for life. something along these lines and btw the arabic grammar is perfect so if you want it tattooed go for it! Hello!!! I’m from Romania and i would really appreciate if anybody could translate for me ” Heart of a lion” in Arabic. It means a lot to me, thanks ! Can some one please help me translating this to arabic? Approximately 90% of these tattoos are embarrassingly wrong. They mean absolutely nothing in Arabic and have clearly been “translated” (if you can call it that) incorrectly. 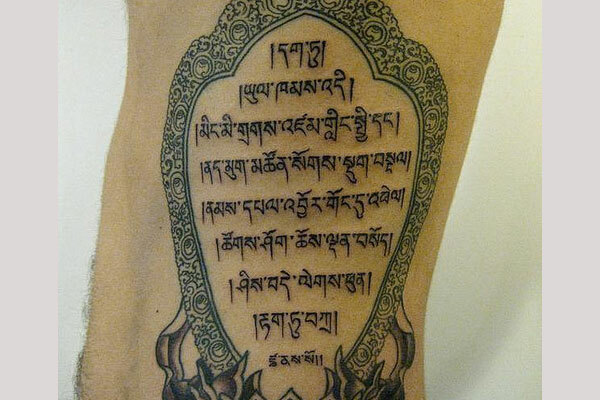 For example, the first tattoo was propabalu trying to say “‘Mary”. It is not connected, and backwards , and reads “aryam” in Arabic. The one that says “Karl” looks like someone hit four random buttons on an Arabic keyboard and does not say Karl. The rest are pretty much all screwed up. Find a speaker who can translate for you before you get inked. And an other thing…. is it true that VICTORY it is called ENTISAR… or INTISAR in arrabic language???!! Please write with the big space between words to see them well and if is possible i would like to see the both spellings… arrabic letters and common letters. I wish so much to spell the sentence wright. Thks.. for understanding. Kisses from me. Karl is not L-K-A-E….. and half of these are written backwards. Meaning, the letters are in order like english would read (left to right) but should be right to left. So many of them are disconnected, which is a dead give away that you have no idea what someone just permanently tattoo’d on your body. Arabic is a language only written in cursive form. I’m an Arabic translator, let me tell you hard my coworkers and I laughed at these…. but i am getting all these different answers and so worried. Open to proverbs or sayings that represent the same. Could someone kindly please reach and translate “strengthen me” from right to left (the proper way?) ? Hi, how do you write “happiness” in arabic? Thanks. hi, can someone translate for me, family is forever or family forever or something similar in arabic, if its different to the two i’ve mentioned please let me know the meaning. This will not make sense in Arabic since we do not have RIP in our language. Still doesn’t make any sense. Both of these are not abbreviated at all, and only the second one is similar to what the English sentence means. But it doesn’t work despite of that, because it starts with “a” and “to return” doesn’t. Word plays are insanely difficult to translate. One could of course try something like: “Ø­Ø¨Øª ((Ø±-ÙŠ-Ø¨)) ÙƒØ§Ù† Ø¨Ù…Ø¹Ù†Ù‰ ((Ø§Ø±Ø¬Ø¹ØŒ ÙŠØ§ Ø­Ø§Ø²Ù…!”. But where’s the point in that? In any case “I miss you Hazem” is easy: “Ù…Ø´ØªØ§Ù‚ Ù„Ùƒ ÙŠØ§ Ø­Ø§Ø²Ù…”. People, there are quite a lot of comments here saying this already, but PLEASE make sure the words and letters look PROPERLY before you get them inked into your skin. Even copying and pasting something from here doesn’t guarantee that, only showing them to someone who knows how to read the language will! some of these tattoos are awful! the one that supposed to say “karl” does not even say “karl” when you pronounce the arabic letters!!! the one that says “dominique” is especially awful!!! You have to note that the same sentence can have many translations in Arabic but what i posted is the closest to good Arabic. Remember the arabic is written from right to left. can someone translate follow your heart in Urdu please, don’t know if google translate is accurate. Hi, some of the comments have covered this point, but just to emphasize, a lot of these people have absolute rubbish written on them, either words which do not exist in Arabic, or written in a way which the Arabic language does not allow – for instance – only some letters may be joined to each other, sometimes on only one side. Also, you cannot just write the letters which make up a word singly if they should be joined – that is, it is not like English where you can write a word in capitals. I think the messsage is – don’t get a tatoo which you cannot understand, or at least have someone with you who can read the language. oh my goodness! these poor people!!!!!!! so many of these are written in a horribly incorrect way. imagine someone writing a sentence backward and upside-down with spelling errors, a letter or two that doesn’t even exist and some other random error, and that is what half of these tattoos look like. the absolute worst are the ones which don’t connect the cursive Arabic letters together, which is what forms the essence of the beauty in this language’s writing, with its elegant connections. 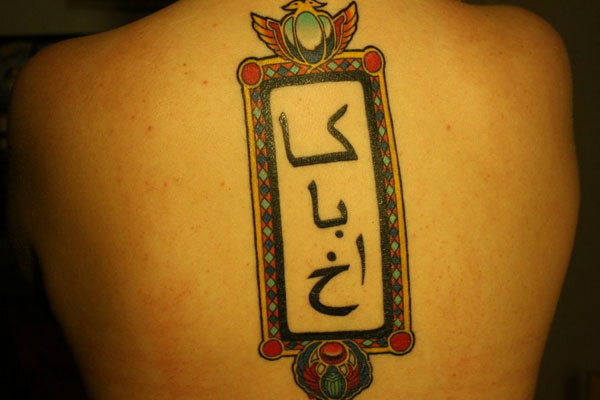 if all your letters are SEPARATE in Arabic, your tattoo is simply ridiculous. even someone with no knowledge whatsoever of Arabic can kind of see that something is wrong. it just looks odd. and even worse with the letters written backwards. mash’allah! I have two girls and their names are Miranda and Danyelle. Could some one translate this phase for me. Note that western names are sometimes difficult to write in Arabic script. One reason is that Arabic only has three vowels, a/i/u – there is no e (except for some of the dialects, but it can’t be written anyways). So the above reads like “Meeraanda” and “Daneeyaala” – the reason for the loooong vowels being that it has become sort of customary to use loooong vowels (Arabic distinguishes between long and short vowels) with western names to make it clearer how to pronounce them. The first word (remember to read from right to left!) makes use of the dual, which is like singular or plural in English but always means “two of something”, in this case angels. The little wavy sign at the end of the word makes it “*my* two angels”. This dual stuff is not usually done in day-to-day language but is often used in literature, poetry, etc. Not sure if it’s been mentioned, but the one that’s supposed to say ‘butterfly’ isn’t faded, it’s actually horribly infected and is just now looking like it’s starting to heal, though it’ll never look ‘quite right’ after an infection like that unless it gets retouched. Hi can any arabic-knowing person help give me the words believer, traveler, thinker, and dreamer but all separately please, thank you. 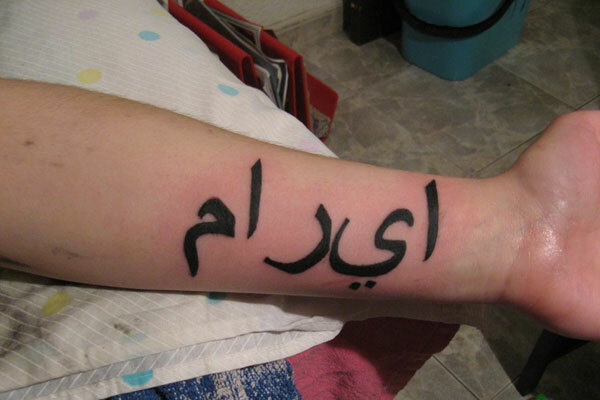 Such a amazing tattoo styles for Arabic people ! You guys this is just wrong! I can read Arabic and some of this is just wrong!!! !